Joey's 275 plus bikepacking bike — Sklar | Handmade Bicycle Frames. Mountain, Cyclocross bikes built to order. Joey approached me last year interested in the ultimate touring bike/townie crusher. Specifically something he could easily strap his skis and camera gear on to and take him far away to crazy adventures. That, or cruise down the hill from his house to the bar with some friends. Anyhow, we decided on a familiar fit. 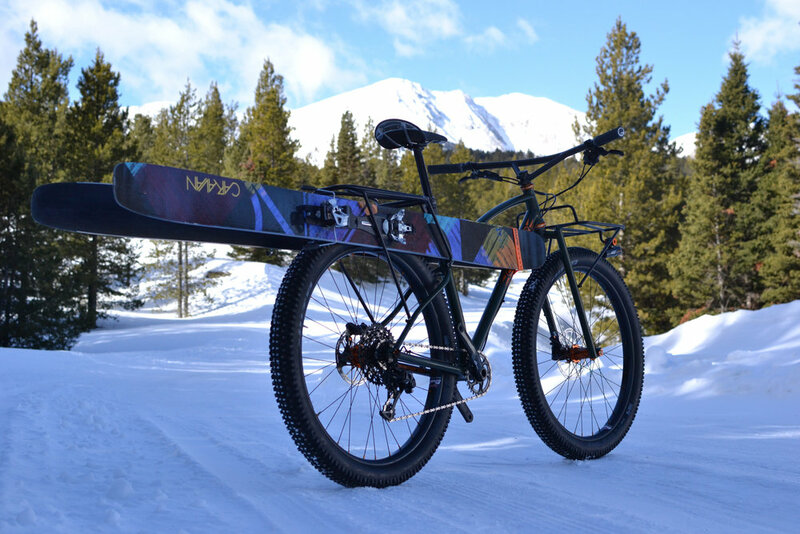 Many hours were spent dreaming up the custom rack system to hold any skis he would like, and a front rack for lots of gear. We decided on 275+ for the wheel size so that he could get some cushion while still benefiting from the efficiency of a rigid fork. He also had the option of a faster rolling 29" wheelset for more road-oriented adventures. Other details like a custom bar-stem and some matching ano parts were added.